BRACKNELL, UK. 27TH JUNE 2017 The latest Panasonic Toughbook 2-in-1 business rugged notebook wins in both the business and style stakes. The Panasonic Toughbook CF-XZ6 is one of the world’s lightest, business rugged, 2-in-1 detachable notebook with a 12 inch display. Sleek and lightweight in design, this detachable will be the envy of any mobile worker. With its business rugged design, 14 hours battery life, powerful latest generation Intel processor and multiple business ports, the device more than matches the needs of any busy executive. The Panasonic Toughbook CF-XZ6 notebook is ideal for white collar workers that need computing power on the move. It brings the flexibility of a lightweight tablet with notebook functionality in a single device that can take the knocks and drops of business life. It is ideal for sales workforces across any industry, health professionals, market researchers, and those in government agencies. 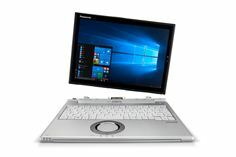 The fourth 2-in-1 detachable in the Panasonic Toughbook range, this latest device has a 10 finger touchscreen, 12” Quad High Definition display (2160×1440 pixels) with 3:2 aspect ratio for crystal clear clarity. The tablet is super-light, weighing just 640 grams, and the tablet with keyboard weigh in at just 1.18 kg. Yet its business rugged design means Panasonic’s traditional low failure rates with the device designed to withstand drops of up to 76cm. The tablet has its own 4 cell battery and can operate standalone for up to 6.5 hours. The keyboard area has an additional, user replaceable, hot swappable, 4 cell battery delivering up to 14 hours in notebook mode. The device has an 8GB memory and 256GB of storage. Powered by the latest 7th generation Intel Core i5-7300U vPro processor, with the Windows 10 Professional operating system, the Toughbook CF-XZ6 notebook has a full set of business ports, including LAN, HDMI, USB 3.1(Gen 1) Type C and USB 3.0. It is Bluetooth v4.1 and WLAN Intel® Dual Band Wireless-AC 8265 equipped with a 4G LTE option. A Full HD Windows Hello capable webcam and 8MP rear camera are standard. Accessories include an Active Pen, 4 cell battery for the keyboard area, anti reflective film and privacy filter for the display. The Panasonic Toughbook CF-XZ6 comes with a standard 3 year warranty and will be available in July 2017 priced at £1539 plus vat.